When searching any source for potential candidates, the ability to search by years of experience can be especially helpful in that years of experience can be correlated to current/desired compensation. If you are recruiting for a position that pays a maximum of $85,000 annually, being able to first source people who are highly likely to be qualified for the role and willing to accept that compensation is certainly more efficient than sourcing and talking to a number of people who don’t have enough experience or for whom that compensation is unacceptable. If you know that people with 5 to 7 years of overall professional experience in a certain role with specific skills in a given industry are generally in the $70,000 to $90,000 range for annual compensation, you would simply be working smart to try and first narrow your search results down to people who have that range of years of experience if that is what the position you are recruiting for pays. As I’ve written and spoken about many times – appropriately deep and searchable human capital data can afford sourcers and recruiters the advantage of more control over critical candidate qualification variables than any other form of candidate identification, including referrals and job postings (social or otherwise), which offer very little-to-no control over any candidate variables (years of experience, education, specific responsibilities, industry experience, etc.). With the ability to control candidate qualification variables such as years of experience and/or likely desired compensation, sourcers and recruiters can work more efficiently with less waste, more quickly identifying and contacting prospective candidates who have a high probability of not only being qualified, but also “recruitable,” and one of the critical aspects of a “recruitable” candidate is the probability of accepting an offer at a specific compensation level. So let’s take a quick look at how you might be able to exert some degree of control over years of experience and thus current/desired candidate compensation when searching LinkedIn for talent using LinkedIn’s filters as well as using Google and Bing to X-Ray search into LinkedIn for those of you who do not have a premium LinkedIn account. If you have the appropriate premium LinkedIn account, you have access to LinkedIn’s Talent Filters – one of which is Years of Experience. I like the tight arrangement of the “Less than 1 year,” “1 to 2 years,” and “3 to 5 years,” but I find “6 to 10 years” and “More than 10 years” are a little too broad for my liking and offer a much lower level of probabilistic control over likely current/desired compensation. 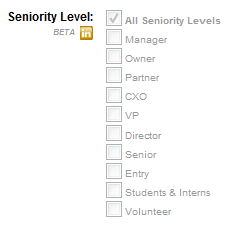 The Seniority Level premium filter isn’t nearly as helpful as the Years of Experience Talent Filter, primarily because it is title-driven, and hopefully you’re well aware of how problematic and non-specific many titles can be with regard to conveying anything highly useful in accurately identifying people by years of experience or true level of management. So, what to do if you don’t have access to the Years of Experience Talent Filter, or if you want to try and control years of experience more specifically than 6 to 10 years or more than 10? Well, you can do what any self-respecting sourcer or recruiter would do – which is try to hack a solution together. As I’ve written about recently, sourcing candidates via searching human capital data isn’t about Boolean search – it’s about Information Retrieval and it’s also an investigative and iterative process. As such, we have to first start by identifying our information need, and then try to figure out how we can construct queries to retrieve results that meet that need. If we are trying to find people who are more likely to currently be at or willing to accept compensation in a specific compensation range without the direct ability to search by compensation data (which simply doesn’t exist on LinkedIn, but does on major online resume databases), we are left to try an influence likely compensation via years of experience. Without the ability to use a years of experience filter, or if you need to be more specific than “6 to 10” or “More than 10” years of experience, you have a few options you can use to try and control years of experience. For example, you can use Google to try and target years of post-graduate work experience. You can see that this works to some extent, without even having to open up individual search results. Of course, there are false positives amongst the results as well, which are to be expected given what we are trying to achieve and how we are trying to achieve it. I recommend experimenting with the number of asterisks between the degree terms and the year. If you’re not sure why I (or anyone) would want to eliminate mention of such a broad range of years on a LinkedIn profile – please let me know. You may be wondering why I didn’t just try to exclude a numrange expression, such as -1990..2003. Well, that’s because it doesn’t work. I tried -(1990..2003) and -“1990..2003” and they didn’t work either. Then I tried NOT, and then I decided to get back to writing. :-) Let me know if you can find a way in which Google processes an exclusion of a numrange properly. Also of note is that excluding some of those years/numbers can cause problems by eliminating some profiles we actually don’t want to because of non-year mentions such as “MS Office 2000,” etc. 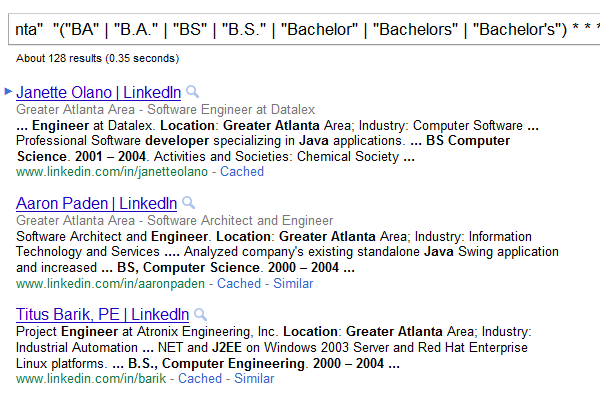 In my opinion, Bing’s support of configurable proximity search is better than Google’s asterisk/wildcard search. However, the major weakness of Bing’s NEAR:X search functionality is that it doesn’t play nice with OR statements, which makes it difficult and/or impossible to accomplish what we have with the above Google searches in a single Bing search. It is important to remember that we are trying to meet a specific information need – finding people with a certain range of years of post-graduate experience – in the hopes of exerting some control over the current/desired compensation of prospective candidates, using tools (Google & Bing) that were not designed specifically for doing so. As such, none of the example searches I demonstrated above are perfect, and please keep in mind that the searches I illustrated are just examples from which you can build upon, experiment with, and tailor to your specific needs. While the searches I used certainly work in some cases, in others they let false positives creep into results as well as eliminate people who actually do match our information need but cannot be returned in search results with the above queries (e.g., they do not mention the dates of their educational achievements, or they simply don’t enter them at all, which as far as I know is not a requirement to complete a LinkedIn profile) – these results are what I refer to as LinkedIn’s Dark Matter. And finally – all of this playing around with mentions of college degrees on LinkedIn profiles has got me wondering why LinkedIn doesn’t offer the ability to search by minimum education level. Seems like a no-brainer, right? Right after they add that as a premium filter, I think they should offer LinkedIn users the option and ability to privately specify desired compensation ranges for people who are actively and “passively” looking for the next step in their career, viewable only to those with corporate and professional recruiter licenses.